Dr. Mahua Bhattacharya is an Associate Professor of Japanese and Asian Studies at Elizabethtown College, Pennsylvania, USA, where she has taught since 2001. Her teaching is focused primarily on Japanese language, culture and literature. Her courses include From Anime to Zen: An Introduction to Japanese Society, Business and Culture, History of Japanese Art and Aesthetics, Introduction to Japanese Literature in Translation, and a popular first-year seminar called Anime, Manga, J-Pop and J-Horror: An Introduction to Japanese Pop Culture. She has developed a short-term study abroad program in Japan, where she takes students from Elizabethtown College every year. 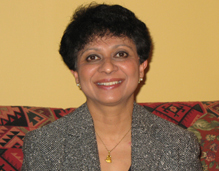 During her tenure at Elizabethtown College Dr. Bhattacharya has pioneered the development of the College’s Japanese major. She is proud of the tremendous growth it has manifested, becoming one of the largest programs in the College, with students coming there to study Japanese from all over the US. A native of India, Dr. Bhattacharya taught Japanese in Jawaharlal Nehru University in New Delhi for 13 years. She also got her undergraduate and graduate degrees at JNU, receiving her degrees in Japanese Language and Japanese Studies in the School of Languages and Literatures, the School of International Studies, and the School of English and Linguistics. Before coming to Elizabethtown College, Dr. Bhattacharya was a Visiting Fellow at the University of Chicago. She has also taught Japanese at DePaul University in Chicago and at Millersville University in Pennsylvania. She has also served as the Director of the Women and Gender Studies program and as Co-Director of the Asian Studies program at Elizabethtown College. Dr. Bhattacharya’s research interests include postcolonial theory, women’s studies, popular culture, language ideology, and second language acquisition. She has participated in several national and international conferences in the US, India and Japan, and has received several prestigious fellowships in these countries. While at IDSA, she plans to work on “Recent Developments in US-Japan Relations: Implications for India.” She is interested in the dynamics of soft power politics and hopes to hold conversations on teaching of India in the US. “Promoting Learner Autonomy: Designing Curriculum for a Short-Term Study Abroad program in Japan” in Ken Ujie. (Ed.). Proceedings of the South East Association of Teachers of Japanese (SEATJ) Conference held at Washington & Lee University, June 2006. Interpreting “Cool”: Orientalist Fascination or Social Critique at panel titled ‘Making Orientalism Work for You’ at Association for Asian Studies’ Annual Conference at Honolulu, Hawaii in March 2011.